OOri delivers the UVify experience in an all-new palm-sized form factor. OOri is the racing drone for everyone: Easy to control, fun to fly, and - most of all - FAST. Pre-orders are now open for the world’s fastest production micro racing drone, the UVify OOri, winner of Digital Trends Top Tech of CES 2018 award and Best Mini Drone / Best Beginner’s Drone award from Drone Rush for CES 2018. Sharing the DNA of the award-winning racing drones Draco and Draco HD, OOri is also best-in-class in every area that matters--speed, agility, endurance, technology, and design. OOri includes everything you need to fly right out of the box. 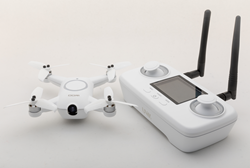 OOri comes bundled with a controller that features a built-in color LCD screen for First-Person View (FPV) piloting, giving you the experience of flying with a bird's eye view of the world. Customizable Colors opens up unlimited personalization options with the push of a button. Easily identify teammates and competitors when racing thanks to its tweakable LEDs. Performance-tweaked Brushless UVify Motors coupled with UVify sensor technology means OOri has more power than any other micro drone. OOri's single LiPo battery and brushless motor combination is a first for a micro racing drone. Lock-on, Pop-off Prop Protector is designed to make it a snap to attach the prop guard to OOri when learning new moves. Taking it off is just as easy when the time comes for greater power and agility. Quick-Click Battery features a plug and wire-free design, which means inserting and swapping out batteries is a smooth experience. OOri's battery is equipped with voltage-protection technology, giving you the freedom to focus on racing in the crucial final seconds. Holds Position automatically, a first for a racing drone. Flatten the learning curve and fly carefree. OOri's ground-proximity sensor lets you focus on developing your flying skills, instead of the ground. OOri is available for a special preorder price of $289 now at UVify.com. Following the pre-order sale, OOri will retail for $389. UVify is a developer and manufacturer of high-performance drones, autonomous technologies, and related hardware and software. The company is dedicated to creating innovative technologies that set standards in drones and autonomous systems and translating them into amazing products. For more information about UVify, visit http://www.uvify.com.